One of the mysteries of the Regina Shober Gray diary is why it came to be part of the NEHGS collection. It is an account of daily (or weekly) life, written between January 1860 and December 1884, and for many of the volumes Mrs. Gray is observant about the relationships of her friends and acquaintances, but far less interested, evidently, in the genealogy of the Shober, Gray, and Clay families. Monday, 4 May 1874: I wrote to Mr. William Gray Brooks about family records – rec’d a most cordial response accompanied by some helpful papers & data; I have written, too, to old Mrs. T. W. Ward, she was daughter to Samuel Gray of Medford, [her husband’s grandfather] William Gray’s younger brother, & I hoped the old lady might throw some light on dark points. But if I do nothing more I am thankful I entered on the business and have unearthed so much forgotten lore of the kind, as I have succeeded in doing. Monday, 12 October 1874: Wrote to day to Mrs. Dr. Swett, to Harriet Gray, Elizabeth Gray, and to Susan Carey about genealogies &c. Also answered Rev. 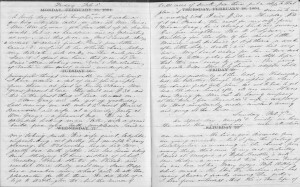 R. M. Chipman’s answer to mine of Aug 19th. He refers me to “Bradford’s Hist[ory] of Plymouth Colony” (lost for ¾ of a century, recovered in M.S. some 25 years ago, and printed in Boston) for facts connected with John Howland’s wife. Instead of being a two day job as I thought, it has occupied 10 days! but I am very glad it is done. Now, unless Aunt Eliza, when she comes on this winter, has new matter for my Records, all is done that I can do; and enough to give my children a general idea at least of the directions in wh[ich] they claim kinship – enough to shew them that an honorable ancestry preceded them in all the branches of their kindred blood – enough to remind them that “Noblesse Oblige” and they must do no discredit to the upright, worthy, honorable men and women whose blood meets in their veins. Thank God that I have no reason to fear for any of them! I can go no further, either on their father’s side or my own, without great expense & trouble, which I am not able to meet, in searching Records & Registers, and corresponding with numberless far away cousins &c.
Friday, 20 January 1882: Rev. Horatio Gray kindly lent me an “Ancestral Tablet” book, which has interested me much; it was drawn up for him by Mr. Harrison Ellery, an accomplished genealogist. I bought two of the books and copied his “Gray” tables – and put in, of course, on the maternal side the very incomplete data I have of the “Clays” in Georgia – my Mother Gray’s family. The tablets only take in down to my husband’s generation, the 8th in this country; but I shall continue them, to [her grandson] little Ralph’s, taking in my family, and when [her daughter-in-law] Carrie can give it to me, hers, as compiled by her cousin Mr. Wm. G. Weld. All in all, with this particular theme in the diary, there could be no place more appropriate for all 26 volumes to come to roost than in NEHGS’s R. Stanton Avery Special Collections! 29 March 1874. All date references to the Hedwiga Regina Shober Gray diary, R. Stanton Avery Special Collections; the year 1878 takes two volumes to record the Grays’ European sojourn. Dr. Gray’s uncle John Chipman Gray (1793–1881). Lydia Gray (1788–1874) was married to Thomas Wren Ward 1810–58. See Edward Gray, “William Gray of Lynn, Massachusetts, and Some of His Descendants,” Essex Institute Historical Collections 52 : 113–40 at 121–22. Two more of Dr. Gray’s first cousins. Mrs. Gray’s first cousin Susanna Budd Kimber (1822–1913) was married to James Carey 1850–94. See Sidney A. Kimber, comp., The Descendants of Richard Kimber… (1894), p. 41, and her entry at Findagrave. The Rev. Richard Manning Chipman, author of The Chipman Lineage… (1872). A cousin of Mrs. Gray’s. Author of Pedigree of Ellery…, published in 1881. Ralph Weld Gray (1880–1944); his sister Hope Gray donated their grandmother’s diary to NEHGS in 1971. See Nicholas Benton, comp., The Seven Weld Brothers 1800 to 2000… (2004), p. 11. Caroline Balch Weld (1846–1912) was married to Mrs. Gray’s son Samuel Shober Gray 1879–1904. Ibid. While not really genealogical, diaries or letters mentioning an ancestor add flesh to the person. It makes him/her real in the community. Good Heavens ! 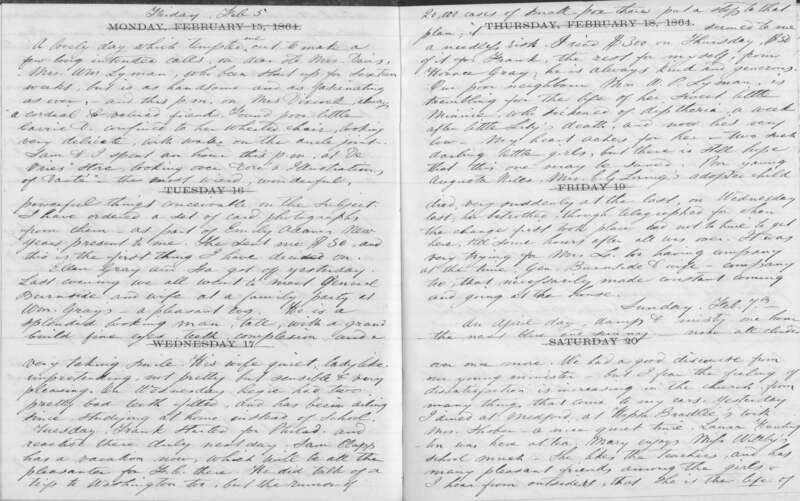 What I wouldn’t give to find a diary left by one of my ancestors. Not really genealogical? Diaries are golden genealogical treasures. They often mention others in the family therefore confirming relationships, or friends and neighbors explaining liaisons and connections we didn’t understand; they explain the why and how of family decisions which might seem obscure to us today, such as moving, migrating or marriages gone awry; they define the manners and more’ s of the time which color personal and family decisions, which we might miss, locked in our own age, as we are. Women’s history so often overlooked or discounted can sometimes only be found in their crafts and skills, in their good works, in their quilts or jams or cookbooks or diaries. Please don’t tell people diaries have no genealogical significance. I know you didn’t really mean they are worthless, I just want to be sure others don’t discount what could be their most important discovery. Scott, does the journal show a sample of her ancestral tablets? I am curious how they might differ from our pedigree charts. It doesn’t, Sally — and I have still to look for her manuscript “Record of the Clay-Savage connexions”! I love your reports on this journal and the various themes that run through it. I am fortunate enough to have two diaries, very different from each other. Both are extremely valuable as genealogical resources. The first covers only a few weeks in 1850, written by one of my gg grandfathers. He and his first wife were Methodist missionaries sent from IL to Africa, which then meant Monrovia. N.S. Bastion, his wife Sarah, and their only child, John Tenbrook, b. 1848 arrived in Sept. 1849. Bastion preached, ran a school for freedmen, and made plans for a new building of stone to replace the decrepit wooden building. Six weeks after their arrival, John died of “African fever,” an unspecified tropical disease. Sarah then began a school “for females,” the first one any missionary wife had created; she had been a governess before her marriage. In Jan. 1850, Bastion left Monrovia for New York, via Freetown, Sierra Leone, Marseillaise, and London, to report to the Mission Board. Sarah stayed behind to teach her school. On that trip, he kept a journal in a very small notebook, running out of paper within sight of Barcelona. He wanted to get an English ship directly for London, but after waiting weeks, took a French ship headed for Marseillaise instead. Storms blew them far out into the Atlantic, and they ran out of provisions. The crew had to fish for food. He specifically noted a strange, huge fish called “tuna” which he heartily disliked. He was especially impressed by the Straits of Gibraltar, and made multiple skillful drawings. He also speaks movingly of the death of his son, and of missing his wife. This little journal gave me a new perspective on him that I wouldn’t have without it. The other is one of those yearly diaries, with about three lines allocated per day, that my paternal grandmother used the year of her engagement, 1910-1911. My grandparents lived in the same town, but his engineering job took him away home multiple times per week. She, her 6 sisters and a brother considered themselves the top of the heap in town, at least in the Methodist church. My grandmother, the eldest child, had graduated from the music school at the local college, and all but the youngest sister graduated eventually from the same college, most as teachers. All were very smart, and knew it, and good looking. They would gather on Sunday evenings around the family piano with their beaus and sing hymns and other songs of the day. No dancing or card playing, but they were a fun loving, picnic loving family. She refers to her fiance as “The Boy,” and he joined the fun when he was in town. It’s amazing what a picture of her family life comes through a year’s worth of brief entries. My father transcribed this diary many years ago, with his own commentary on who the non-family members were, valuable in its own right. This diary is especially important to me as my grandmother died years before I was born. I trust what she says because I knew all her siblings, and what she says about each of them rings true. Again, the diary gives me a new perspective on her and her life that I wouldn’t have without it. Both sound like treasures — you are lucky to have two such interesting and disparate ways to appreciate your forebears! Scott, I wonder if this Gray family includes the ancestors of Boston poet Anne Gray Sexton’s (neé Harvey, b. 1928 d.1974) mother’s family? Sexton’s mother’s name was Mary Gray Staples, b. 1952 d. 1959). It would be interesting to see the connection between this Victorian correspondent and the well-known poet who taught at Boston College and lived most of her life in the Boston metro area. That would also be a valuable addition to the NEHGS collection! Steven, I don’t think there is a close connection. Mrs. Gray’s husband’s family can be seen in the EIHC volume referred to in the notes — but an interesting idea, certainly!